Elegant stacked domes, reaching to the heavens, and towering, slender pencil minarets characterize Ottoman mosque architecture. Few mosques, however, are as visually stunning and architecturally significant as the Selimiye Complex in Edirne built by the greatest of all Ottoman architects, if not one of the greatest of architects to ever live: Sinan. 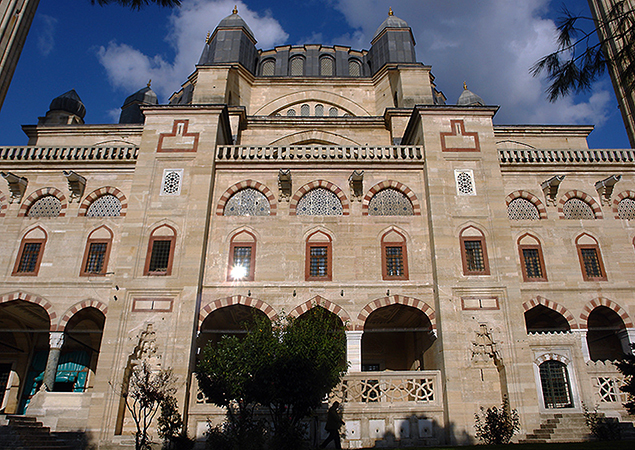 Selimiye complex was located in Edirne rather than the capital, Istanbul. 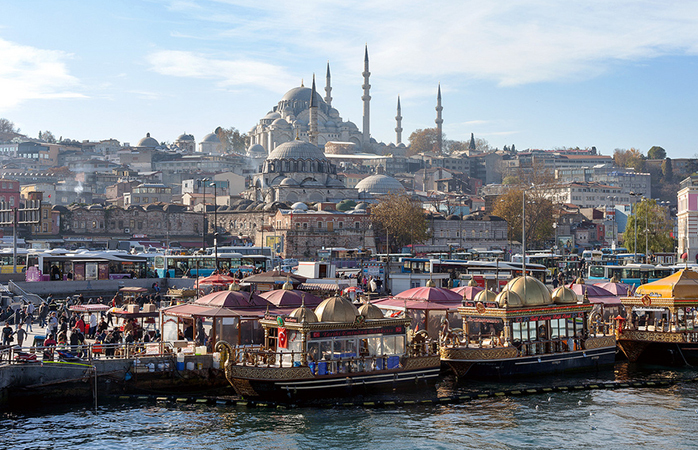 It was built by the Sultan Selim II, the son of Süleyman the Magnificent, between 1568 and 1574. 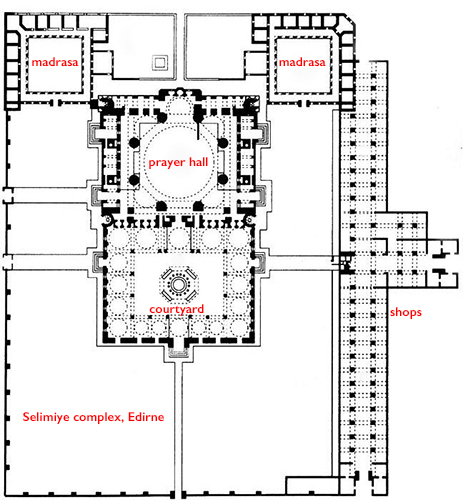 Edirne was one of Selim II’s favorite cities. He was stationed here as a prince when his father campaigned in Persia in 1548 and he enjoyed hunting on the outskirts of the city. Edirne was selected not only because of Selim II’s fondness of the city, but also for its historical and geographic significance. Located in the Balkans, within the European lands of the Ottoman Empire, Edirne had been a capital of the Ottoman Empire in the 15th century before Istanbul and was effectively the second city of the Empire through the 17th century. Edirne was the first major city that Europeans traveling to the Ottoman Empire reached—so building a large complex here offered the Sultan an opportunity to use architecture to impress the Ottoman Empire’s greatness upon visitors. Furthermore because Edirne was not Istanbul, whose Golden Horn and many hills were already home to monumental mosque complexes, it also offered an opportunity to build a mosque that would dominate the city. Built in an area of the city once known as Kavak Meydani, the modern designs of the Selimiye complex overshadowed Edirne’s more traditional architecture. The complex is huge. It measures 190 x 130 meters (or more than the length of two football fields) and is composed of a mosque, two symmetrical square madrasas (one of which served as a college for studying the hadiths, or traditions of the Prophet Muhammad), and there was a row of shops (arasta) and a school for learning the recitation of the Quran located to the west and added during the reign of Sultan Murad III, whose rule followed Selim II. It is likely these additions were planned by Sinan. The mosque’s nearly square prayer hall is approached through a porticoed courtyard, making the central block of the complex rectangular. The approach to the north façade of the mosque (above) is dramatic: the aligned gates of the outer precinct wall and forecourt focus the eye upwards toward the dome, which could also been seen from a distance. The ethereal dome seems weightless as it floats above the prayer hall. All of the architectural features are subordinated to this grand dome. The dome rests on eight muqarnas-corbelled squinches that are in turn supported by eight large piers. Muqarnas are the faceted decorative forms that alternately protrude and recess and that are commonly used in Islamic architecture to bridge a point of transition—in this case, the broad base of the dome above and the slender piers below. Note that the muqarnas steps outward it rises, creating a corbelled effect, and allowing for a more open space below. The squinches are the architectural support, decorated by the muqarnas, transition from the dome down to the eight piers. They allow the round base of the dome to join octagon formed by the piers. A complex system of exterior buttresses support the east and west piers and do most of the work to hold up the massive weight of the dome. These buttresses are artfully hidden among the exterior porticos and galleries. In the interior, galleries fill the spaces in between the walls and the piers. The Qibla wall (the wall that faces Mecca) projects outward further emphasizing the openness the interior space. Sinan completely departed from the screen walls and supporting half-domes he had employed in his earlier design for the Süleymaniye Complex in Istanbul. 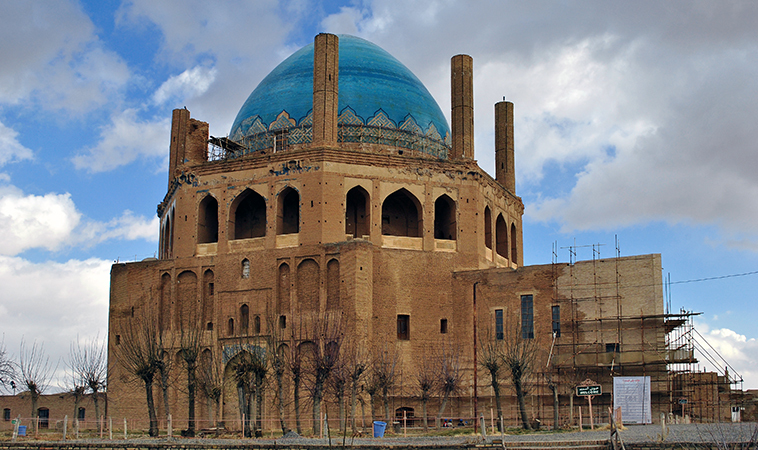 The placement of the muzzin’s platform (müezzin mahfili), under the center of the dome is very unusual. From this platform, the muzzins who lead prayers, chant to the congregation. Gülru Necipoğlu, a leading Ottoman art historian, has compared its placement to that of a church’s altar or ambo, a raised stand for biblical readings in a church. 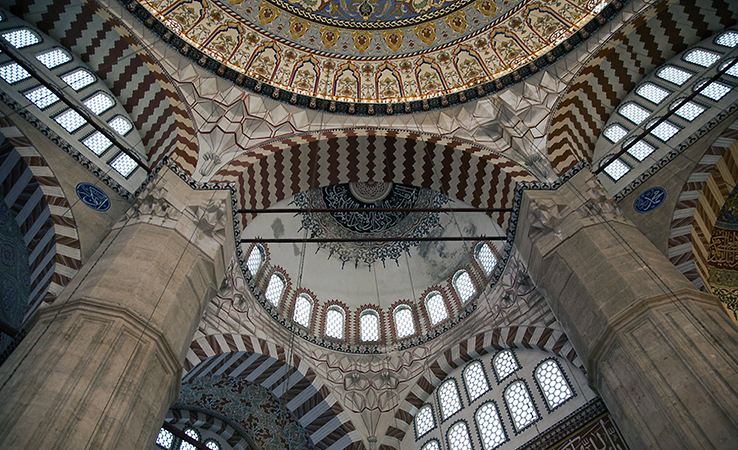 She notes that while this innovation disrupts the space below the dome, it reflects Sinan’s interest in surpassing Christian architecture. The position of the platform also creates a vertical alignment of square, octagon, and circle, using geometry to refer to the earthly and heavenly spheres. The original appearance of the interior’s decoration was different from what we see today. The interior has been repainted through the centuries and was extensively restored in the 20th century. 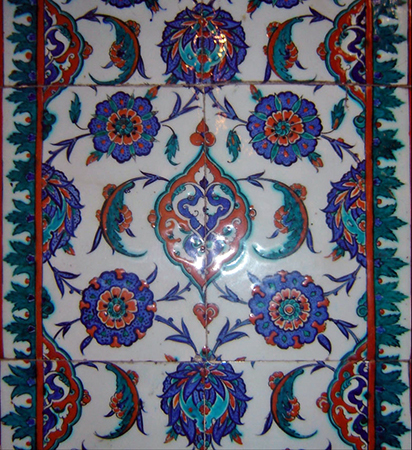 However, the brilliant, polychrome Iznik tiles, the epitome of Ottoman decoration, and whose motifs include iconography such as saz leaves and Chinese clouds, remain largely untouched since the 16th century. The mosque’s epigraphic program—its inscriptions, was developed after the devastating defeat that the Ottoman fleet suffered at Lepanto in 1571 against the navies of the Christian Holy League. This loss prevented further Ottoman expansion along the European coast of the Mediterranean. The mosque’s inscriptions focus on a central difference between Islam and Christianity—mainly that Allah (God) is indivisible and that the prophet Muhammad is God’s human messenger. Certain passages from the Hadiths were included to emphasized Muhammad’s position as a messenger both and intercessor. The unified, open plan of the mosque is matched by the artful stacking of volumes on the exterior. Unlike many other earlier Ottoman mosques and the early Byzantine church, Hagia Sophia (then converted to a mosque and now a museum), the exterior is clearly not an artistic afterthought but rather an elegant, architectural shell vital to the overall composition. 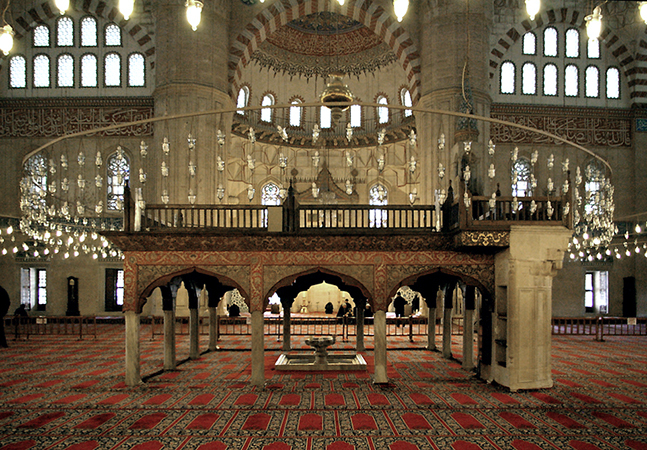 The placement of the pencil minarets at the four corners of the prayer hall focus attention on the volume of the Dome. Polychrome exterior is composed of stone mixed with brick that compliments the geometric volumes that define the exterior forms of the building. 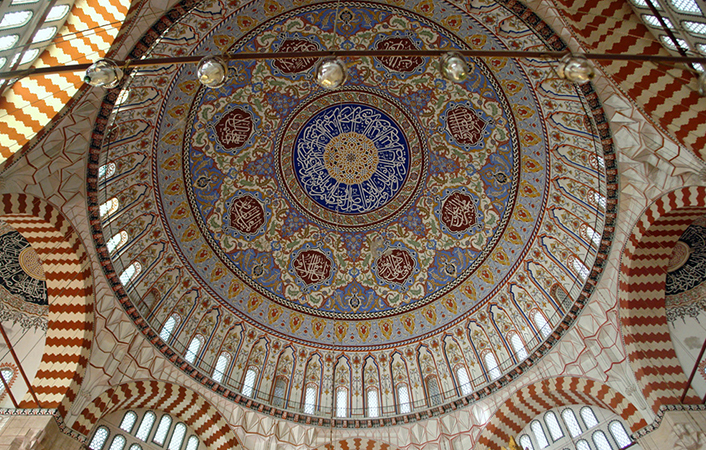 The dome’s octagonal shape was probably influenced by the tomb of Öljeitü in Soltaniyeh, which Sinan had seen while on Süleyman’s Baghdad campaign. The tomb had a large octagonal dome of 25 meters, which at one time was surrounded by eight turrets, which we can see echoed at Edirne. 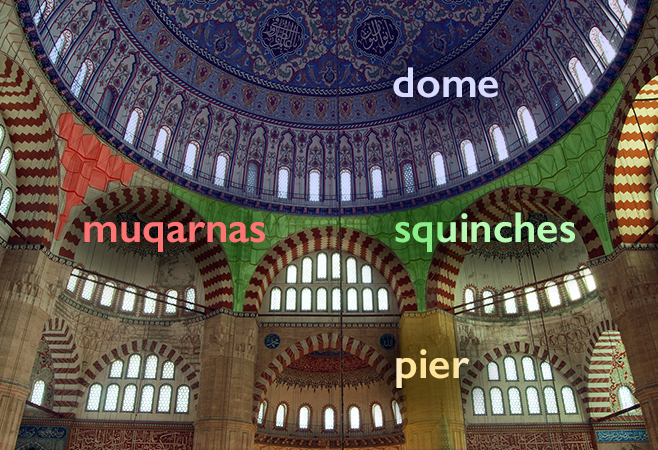 Sinan’s dome, at just over 31 meters, is larger than Hagia Sophia’s. The architect had wanted to disprove claims that no architect could match Hagia Sophia. Selim II funded his project with booty taken from the Ottoman campaign against Cyprus, a Christian island. 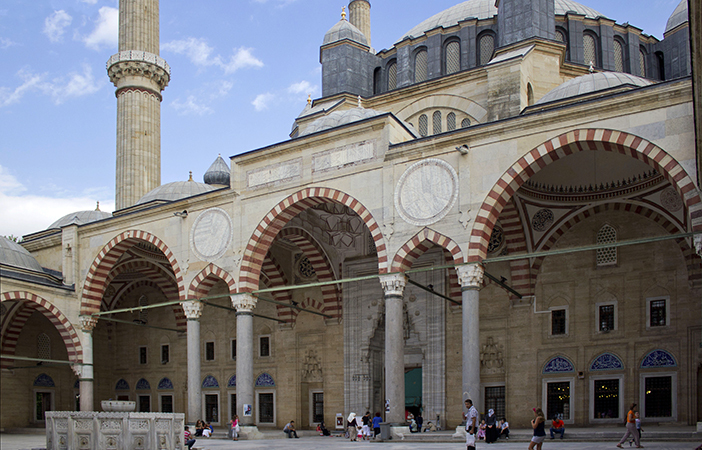 Sinan sought to build a monument for the Sultan that expressed Islam’s triumph. 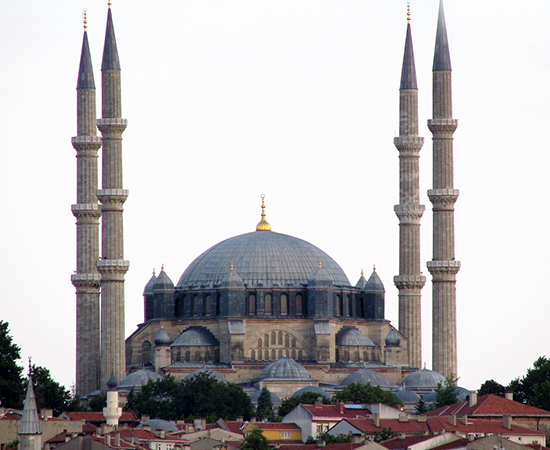 His achievement—building a mosque that surpassed Hagia Sophia—was recognized as soon as the mosque was complete. Evliya Çelebi, a 17th century writer who traveled extensively across the Ottoman Empire, praised the mosque in his ten-volume Seyahtname, (or “Travelogue”). Mimar Sinan was a product of the Devşirme, a practice of the Ottoman authorities from the fourteenth through early eighteenth century, where young, talented, Christian men were taken from their families to serve in the military or the civil service. Sinan was one such boy; he served during Süleyman’s campaigns, learning engineering and siege warfare before becoming one of history’s great architects. Cite this page as: Dr. Elizabeth Macaulay-Lewis, "Mimar Sinan, Mosque of Selim II, Edirne," in Smarthistory, August 8, 2015, accessed April 24, 2019, https://smarthistory.org/mimar-sinan-mosque-of-selim-ii-edirne/.